While the image to the left may not be that appealing to you, I swear, it's heaven to me. My old regret is that I did not photograph Thursday's breakfast. This, dear friends, is "Oatmeal a'la Perry". He makes it two ways, on the stove top or in the crock pot. He uses Quaker Steel-Cut. Then, depending upon whim, he will add dried fruit, nuts, almond milk, brown sugar or molasses. Cinnamon and nutmeg permeated the house on Thursday morning. What a warm and inviting smell to awaken to. And, knowing it was oatmeal made it even better. I actually didn't stop for lunch until about 1:30 p.m. on the way to Connecticut. 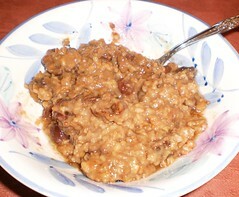 Plus, this nourishing oatmeal, served up Tuesday morning, sustained me through the break down of the car. I had Altoids in my car and a little something from David and beer, but oatmeal kept me going. Steel-cut oats are different from the stuff you buy with the Quaker name slapped on them. I prefer Scottish oats. I have mentioned before that I buy my oatmeal from Bob's Red Mill which is sold at Whole Foods. It produces a creamier texture because the oats are ground coarse rather than cut. Any way you serve it, oatmeal is an exceptionally good way to start a day. I don't find those "add water" packages to be as rib-sticking. Plus, I think there's too much that's not good for you in those packages. I don't eat oatmeal during the week as the way I make it doesn't lend itself to quick breakfasts when you get out of bed late. It's still Cheerios. But, as winter approaches, you cannot beat oatmeal on a frosty weekend morning. Thanks, Perry, for comfort and deliciousness.